3. On your phone, hold down power, volume up, and volume down buttons simultaneously. When the device powers off, let go of the power button but keep holding down the volume up and volume down buttons until the bootloader screen appears. 4. Quickly press the volume down button until AP Fastboot is highlighted and then press the volume up key. When entering `fastboot flash modem NON-HLOS.bin` it fails, and when doing `fastboot flash system system.img` I get a `target reported maximum download size`. Help? i flashed every single one perfect till i got to the end system system.img it said max download size.. Did u ever get that figured out man cuz im not sure wtd. Hoping you do..??? Make sure the zip file you downloaded isn't corrupted. For modem and system you should see fastboot loading them in chunks. Potentially off topic, but you appear to know your way around android systems. I have installed safestrap and have a CyanogenMod kitkat rom running though it. The problem is that upon reaching full battery discharge i need to use the 'jumper leads' as usb charging is not functional until it hits the safestrap menu, and due to my lack of care it reaches 0% every week or two. Do you know of a method of restoring the original system files responsible for charging from pre-boot/recovery/fastboot menu? Can you please help me return my razr m recovery back to stock. I'm running KK and wanted to take the latest OTA minor update. A step-by-step noob friendly guide would be awesome. TIA.. I have been running CM 11 nightlies for KK bootloader but when I installed that I didn't realize about the GPS issue so I've followed your process and downgraded my bootloader to the JB one and have tried installing the latest snapshot (M10) and nightly (9/25/14) of the JBBL version of CM 11. Unfortunately in both cases CM never boots. It just hangs at the bootloader warning/logo screen. I never get to the CM splash screen, even after waiting at least 10 minutes. I've flashed back to stock once already (as your steps suggest) but still no luck. Any suggestions? Thanks for uploading the stock recoveries. I managed to return to stock. Do you have the stock build.prop as well? The one before the September OTA update? I keep getting " build.prop has unexpected contents" error when trying to update. I tried my backups but still getting the same error. TIA. No, sorry. I haven't seen that error before. Thanks. I found a build.prop from the latest update and tried comparing mine and found nothing different except the build name and numbers. I have no idea what's causing that error. Thanks for all your help. I am stuck at step #12 where i changed my directory in command prompt to the location where i extracted Kitkat files. Using the first command "fastboot -w" output i receive is 'fastboot' is not a recognised internal or external command, operable program or batch file. After successfully putting all the commands my phone returned to ap fastboot then again i entered the last command "fastboot continue" now i am on the boot screen droid animation thing going on and i need to wait for 10 minutes from here on .My phone is connected to my pc and is automatically installing the drivers right now. Setup wizard starts its not even 10 minutes just 3-4 minutes. Thanks you brother for helping me out. What to do if I just want to run the stock Verizon OS,version 4.1.2 ? please give the commands ! Hi Siddharth, use the 4.1.2 link in Step #10 above. While putting 4.1.2 stock Verizon OS i am getting this problem at command line "fastboot flash boot boot.img" it says Partition (boot) Security Version Downgraded preflash validation failed for boot. I took the September OTA and the dates became July. Isbit supposed to be like this or it should be September. Hi Siddharth, restoring to stock OS is all-or-nothing. It sounds like your custom recovery is conflicting with the stock boot image. If you're using the exact steps in my guide above, then it's probably your locked OTA KitKat bootloader conflicting with the downgraded JellyBean boot image. You'll need to install the stock KitKat OS and then root your phone and unlock your bootloader to downgrade to JellyBean. Hi Murk, I'm not sure what the date is supposed to say since I ditched the stock OS a long time ago and have been happily running Cyanogenmod. It's OK. I wonder if you know of a link where I can download the 182.46.15 OTA cause my phone downloads the 182.46.10 when taking the OTA not sure why it's doing that. Though the OTA splash screen says I'm donwloading the 182.46.15, after it's done it's the lower version one. I wanted to make a stock TWRP backup before switching to Kitstalk probably for good. Hi, I thank you for your step by step guide. I couldn't even get my phone past the start up. Now it will at least get to the main screen. I had one issue that I can't seem to get past. When I type the commands, I fail the command fastboot flash boot boot.img, I downloaded the firmware a few time to make sure it wasn't corrupted but I get the same resulted. I'm install in a xt907 (4.4.2). Any ideas on how to get this corrected? My phone is locked, and the only way I can load it with factory load. Hi Matthew, make sure you're using the Motorola version of Fastboot (step 6). If you are, please add a comment with the exact error message you're getting so I can review further. I typed that command it gave the okay and the code for the unlocked to be checked at Motorola. I visited the site and they said its not eligible for the unlock key. Mr. Blue, Thank you for all your hard work in the post. I figured it out and found a command that bypass's the error for the boot loader. I re-install the rom using your commands. After I started the phone, after setting up all the settings I turned it back off and the sticky Sticky bit factory _fastboot error came up. I went back into AP boot and typed the command "fastboot oem fb_mode_clear" and "fastboot continue" the phone rebooted and the error hasn't come up again. Thank you again for your help, I hope this little bit of information will help someone else also. My phone was stuck in the "eye" animation during boot, so I decided to start fresh and flash with Kitkat. I was unable to do it though, because the phone said it was locked (probably because I had taken the OTA Kitkat update previously). I kept getting the error that preflash validation failed. I finally decided to enter all of the commands from step 12 regardless of whether they were successful. It worked! My phone rebooted and went to device setup. I'm up and running again! Thank you so much for these instructions!!! I just want to let you know that this walkthrough just saved my phone. My phone wasn't taking the KitKat OTA so I tried to jam it through via fastboot without really realizing what I was doing - the result was I had a rather shiny looking brick that could get into AP FastBoot mode and that was about it. Thankfully, following your instructions, I was able to get all of the files updated that needed to be updated and then I was done! I will note that, after "fastboot continue", my phone didn't come back on at first. So, as a last ditch effort, I tried to load Recovery, which failed - got the dead Droid with the exclamation mark. After a few minutes, though, the phone randomly rebooted on its own and came back to life. Not sure how or why, but it would appear your instructions provided just enough data for the phone to pull its wits together and come back to life. You the best man Mr Blue. Thank you so so much, everything worked like magic. Having a hard time rooting on KitKat... towelroot doesn't seem to work for me. A lil help there? Hi David, glad it helped. It works on my 64-bit Lubuntu Linux and Windows 7 machines. What OS are you using? I came across this guide when I couldn't get my Droid Razr M to boot (stuck on the "eye" animation). I can't thank you enough for getting my phone back to a usable state. However, after running through the steps and installing stock KitKat 4.4.2 (version 183.46.10), my phone keeps trying to push update 183.46.15 on me. Whenever I try to install it, it fails. Any ideas on how I can get the update to stick? Hi Matt, is your phone fully charged or plugged in when running the update? Is it having trouble downloading the update or installing it? Do you receive any error messages or can you describe the failure a little more? Update is downloaded, it fails when attempting to install. I've tried it with all combinations of full battery, half battery, plugged in, and not plugged in. When I select "Install Now", the phone shuts down, the update progress bar makes it to about 25%, then it immediately displays a dead Android robot with a red exclamation point over his chest. The phone then reboots saying that the update was unsuccessful, then it will start nagging my to install it again after about an hour. I will also note that when I ran through the steps from your post, not all of them completed successfully. Which steps in my original instructions didn't complete successfully? A red exclamation robot is sometimes a sign of a corrupt recovery image. Sorry, I don't recall. I was in desperation mode and trying anything to get my phone to boot. Would you recommend running through all the steps again? Hi Matt, if you don't mind the extra effort I would recommend running through all the steps again and detailing any errors you encounter. Hi Siddharth, unfortunately that is correct -- the latest OTA update patched all the root/unlocking exploits so you'll need to wait until the next brilliant hacker finds a new way in. Sorry. I have some issue after following all the above procedures my phone came back to life. But when ever my phone turns off or I switch off it never really switches off as it goes into AP fastboot screen. In that case i have to press all three buttons together to do a normal boot. Can you help me with this problem its annoying me. Currently I am at .15 but this problem is since .10 after following ur instructions. The ota also didn't correct it. My device is bootloader locked and unrooted. Any solutions pal ? Hi Siddharth, from your description it sounds like you're stuck in a "fastboot mode on reboot" loop. Try running "fastboot oem fb_mode_clear" and then "fastboot reboot"
Hi Muhammad, I'm glad you solved the low battery issue and were able to get your phone to work again. You can not downgrade with a locked bootloader so that might be your problem. Do i need to follow all the procedure again ? I don't have the required files right now and also sbf droid developer site is down so somehow i have just managed to get Motorola fastboot but not the STOCK OS .15 OTA. Hi Muhammad, have you considered installing a custom ROM (like Cyanogenmod) instead of the stock ROM? I get the error message update gpt main version failed. You can just skip the gpt.bin step if you get an error. Sorry, I tried many things...I followed your instructions and then my touchscreen doesn't respond..I followed the instructions about this the ones muhammad smaily said but still can't get it to work...Could you help me? Ok...now It won't flash the system.img even does have the same firmware it had before. Hi, I'm sorry...it was my fault...reinstalled everything all went well. Hi... Please pardon my ignorance. I am totally new to this stuff and trying my best to follow the instructions in the hopes it might save my phone. I am in fastboot mode and connected with factory cable. I have the device drivers installed. Can I get some noob instructions on properly downloading and extracting the zipped files? I thought I followed the steps but command prompt is finding nothing for "fastboot devices". Where should I extract them to? I see "extract all" when I click open. Is that I should do or am I missing something? So sorry again, I appreciate any help. Can you root .15 please? I get a validation failed issue for boot.img and for system.img. I figured out how to make this work. I am using the droid razr m, and if you read the above comment you'll see I was having an install issue. I am not sure on my theory about forward compatibility but I am certain of backward compatibility. You cannot revert the file systems. If you have 4.4.2 when getting bricked, you must find the 4.4.2 OFFICIAL VERIZON files on the internet and download them. just google it. That was mine, anyways. The reason you HAVE TO use this file with these instructions, is because with the droid razr m, the bootmenu is locked, and not unlocked for you to load any rom or recovery mode you want. depending on the model you have, you can unlock it through motorola's service online. Armando & Jake, I'm glad everything worked out and thanks for sharing your solutions! Erasmo, it sounds like your original stock zip is corrupt (see http://goo.gl/o18PCC). Did you get any errors on the flash modem step? Nolly, sorry but creating root exploits are way above my skill level. I'll keep an eye out, though and publish a link if I find any. Hello mr blue what different firmware 182.46.15 and 183.46.15 for motorola razr M?And which one the better for signal network reception? Hi Golberg, I avoided the *.15 upgrade because it prevents me from rooting my phone. If you haven't upgraded yet, you may want to consider unlocking your bootloader first in case you ever want to root your phone (see http://www.andromods.com/root-unlock/183-46-15-ota-droid-razr-hd-maxx-hd-razr-m.html). Regarding your question, though, I believe the only difference is the phone models the update is applied to (they use different versions for different Razr models). Hello Mr Blue do you have this two firmware(182.46.15en.us and 183.46.15en.us)for Motorola Droid Razr M XT907.Or can you tell me where can i get it? Mr Blue Coat - just wanted to say thanks for the tutorial, and for having all the files referenced in one place. I was able to reflash my Razr M with VZW stock firmware (183.46.15), and now it is working good as new. Hi Stu, glad it helped! #2 - I think I found the proper fastboot, but when i try to run any of the fastboot commands, I get "The program can't start because AdbWinApi.dll is missing from your computer. Try reinstalling the program to fix this problem." I automatically assumed this was a motorola driver issue, so I redownloaded the most recent drivers. Same issue. I then downloaded sdk-tools lite version that has that dll, but I'm still getting the same issue. I've unzipped everything, and I've tried rebooting. Is there a particular folder I should put that DLL in so that the fastboot can run? Mr. Blue,I,m using Motorola Droid Razr M XT907 and it firmware is KDA20.62-15.1 system 183.46.15. i want to change the firmware to KDA20.62-15 system version 182.46.15. can you tell me what i must do? Hi Golberg, I'm not sure how to switch between 183.46.15 and 182.46.15. Sorry. my device is a verizon droid razr m so I followed your tutorial and i successfully entered the above commands except the last but one (" fastboot flash system system.img"). please what should i do now to bring my phone back to normal? Hi Kokou, the "bootloader unlocked" message is normal (that's part of the rooting process of your phone). 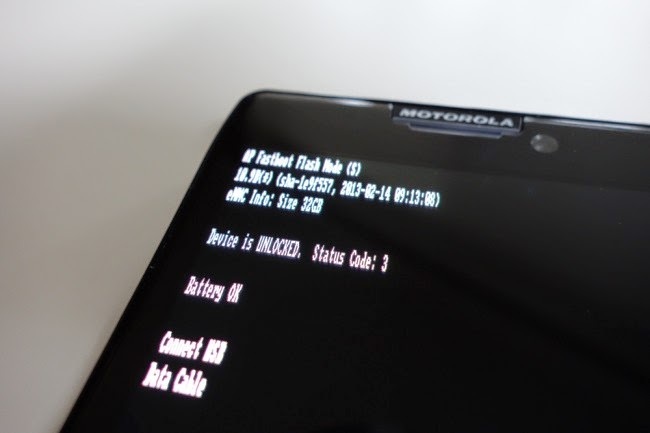 Are you sure you're using the Motorola version of fastboot? Thanks so much Mr Blue Coat, I just did it with the Motorola version of fastboot.Once again thank you. Help! I flashed my RAZR MAXX HD with the rom you included in your instructions that says it is for custom firmware. It flashed fine so i set the phone aside to charge overnight. I came back to it in the morning and it will not respond, it will not power on or respond to a usb connection. To me it appears to be a brick. What did I do wrong and is there anyway to fix it? The phone boots to Fastboot by default. Then I have to boot holding volume keys and select normal boot. Do I need to run all steps? Or just a subset? Hi Steve, I recommend going through all the steps if you don't mind restoring your phone to stock. Thank you Mr. Blue Coat! I had 4.4.2 and a LOCKED bootloader, but this sequence worked just fine using the stock OS. Your link for VZW_XT907_4.4.2-KDA20.62-10.1_CFC_1FF didn't work (some access limit reached), but I was able to search and find it (on https://www.androidfilehost.com/). Hi Bryan, thanks for the feedback! if yes so plz help me or give me any helpful link..
please I need a video or picture guide on how to go about it from 7 to 12.
how long it takes to flash system.img? No more than 5 minutes. Usually just a minute. Only if you have root and an unlocked bootloader. wen i enter tools it says "tools not recognised as an command,operable program or batch file"
Hi Olax, make sure you're running the commands in the same folder where the fastboot executable is located. For example, if you make a folder in the C: drive called "mobile" and put fastboot.exe in that folder, you would open a cmd command prompt and type "cd C:\mobile" [ENTER] and then type your fastboot commands. Note: depending on your phone OS version, you may not be able to root your phone or install a custom recovery. I am using the Motorola fastboot in Windows 7 with the adbwinapi.dll in the same folder. I've renamed or removed all other copies of this dll in my path. Woot! Reread the entire post and comments, I decided to try RDSLite just to check and Voila! Thanks for your links and very clear instructions. This time I paid attention to your comments to the less tech savvy folks. Hi Ken, glad it worked out! Hi Br Studios, I am not aware of a root exploit for 183.46.15. Sorry, but at the moment you can't unlock your bootloader or root your device. I'm so thankful I found this article because my phone is finally booting up again. Thank you for getting my phone to work again as well as teaching me something new about my phone. Hi Tyler, I'm glad it helped! And then the phone come to live again, until some days after, it get bricked again. I'm tired of flashing one, and one more time. Can you help me to identify what is happening? Why the software bricked constantly? // [10:54:03 PM] Alex: What I can do for you is to connect you over to our dedicated chat support team in Latin American Support to better assist you with regards to your concern. Let me get the link where you can get a hold of them. Please give me a moment. // [10:55:45 PM] Alex: As much as I wanted to help you, since this is regarding the software issue, we have a dedicated team who will further assists you on this concern. // I regret what happened but checking their previous chat can confirm that his mobile was imported. Conclusion: Send us you phone and some money. Hi Enner, it sounds like a faulty battery connection. Does your battery drain just before it re-bricks? I am using Motorola Droid razr M (xt-907). one day it just turned off and even after many attempts it was not booting. I read a blog suggesting that I just press (power+vol up+vol down). it worked and i was very happy but it got stuck on logo screen. I tried flashing through RSD lite but it failed to flash logo but my phone was alive again. BUT yet again it started uninstalling random apps after 2 days. I flashed it again. this continued for about 2 weeks then one day after flashing it came directly to fast boot screen saying "failed to hab check for boot:0x56.....Fastboot reason: boot failure" plus on logo screen it says "Customer id error: contact dealer..... boot to suspend/TCMD mode:dead:ffff:000000:000000cc"
PLEASE HELP!!!! I love my mobile. I have tried approx every thing. Today i tried to flash back to stock using utility but no luck. system,boot etc are not flashing. My device is not rooted. Device is Locked. Status code:0.
if I press (power+vol up+vol down) i go to the the boot mode and following 5 options appear. first i flashed VZW_XT907_4.4.2-KDA20.62-10.1_CFC_1FF.xml but it didnt work. Then i tried VZW_XT907_4.4.2-KDA20.62-15.1_CFC_1FF.xml and all commands worked and now for the first time in a long time I have crossed the logo screen and now the droid eye is shining brightly :) WOWWW it worked !!!! Thanks again Mr. Blue Coat. I am getting an error when running "fastboot devices" it reads "The program can't start because AbdWinApi.dll is missing from your computer. Try reinstalling the program to fix this problem." The file is sitting in System32 right now. What is the fix? i just follow the instruction and my phone is a live .. i use several ways to flash but fail avery time ..
Hi Enner, I understand how difficult it can be dealing with a problematic phone but swearing and ranting on my blog isn't an appropriate place to vent your frustrations so I needed to delete your comment. Feel free to participate in the conversation, though, as long as you keep it clean and professional. Thanks! Hi Andrew, holding all three buttons until it turns off and then releasing the power button while still holding the volume buttons down didn't work to get you into the bootloader screen? Even with a locked bootloader you should be able to restore the original Verizon stock OS. hey Ive done the 15.1 install because none of the others would do it with out errors but my phone still boots into red eye, do you have any advice on how to fix it? Never Mind! I tried VZW_XT907_4.4.2-KDA20.62-15.1_1FF and that one worked. Thanks for the update, My friend is facing this issue lets see how does this work for her. Hi Robert, it sounds like you're not using the Motorola version of fastboot. If you're sure it's the Motorola version, try each of the three options in Step 10 to find a match for your current phone's firmware. Also my device serial number came up how does that fit into this whole equation? still the same.. it is restarting in download mode. ok Mr.Blue Coat ive figured out that i was setting the command prompt up wrong from your previous comments (thank you for that by the way) but now the fastboot -w says that it failed to erase partition.and when i try to flash partition gpt.bin it says that it sends the partition and that it writes the partition but when it gets toward the end of the command it says that it failed to program partition table. Do you have any advice on what it going wrong and how i may fix it? Hi Robert, can you post your exact error message when running "fastboot -w"? Also, when your phone is in fastboot mode, does it say the device is locked or unlocked? Hi Azmat, if your phone keeps restarting in "download mode" (a.k.a. bootloader mode) it means the flashing didn't "stick". Do you get any errors from the steps outlined in my original post? Are you running "fastboot continue" at the very end or just turning off your phone? Hi, Mr. Blue Coat when my device is in fastboot mode it says "device is locked" and when i try fastboot -w the command prompt says "erasing "userdata" then Failed to erase partition and FAILED (remote failure)"
But i wanna to ask, can my device to downgrade OS Kitkat Build 183.46.10 Kernel 1 May 2014 ?? I want to Unlock my Bootloader to use CyanogenRom. Hi Yohanes, once you upgrade to .15 you can't downgrade to .10. Sorry! i try to flashing system image .10 its work, but my kernel cant downgrade to 1 May , thats LOL..
Hi Mr. Blue Coat, I seen you've been helping many so I thought I'd ask mine. I've done a very bad thing. Without unlocking the bootloader which seems impossible for this particular build, I flashed cwm recovery. Now my stock recovery's gone. Where can find a copy and guide to flash back to stock recovery. Brilliant posts well done to you, do you know if there is a way of re enabling the fm module of the razr m. on jb the fm player worked but now on kk its just disappeared. Hi Bluecoat, is KDA and KPA recovery image the same? Please confirm before I proceed. Thanks for your help. Hi Nik, I'm not sure I understand what you mean. The stock recovery image is included in the zip files listed above. Hello again Mr. bluecoat, I meant the link you gave for download is for KDA build version but the rom in my phone is a KPA build. Would the recovery in 2 different builds be different? Thank again. Hi Nik, thanks for the clarification. You should be fine with the KDA version. OK, I tried but it just says waiting for device. Nothing happens. Does the "fastboot devices" command indicate the device is detected by your computer? It's possible you don't have the necessary drivers installed to connect your phone properly. I would just like to say thank you so much for this post!! I followed these steps after my Droid Razr M got locked up in the load up screen starting up. Almost immediately not only was it working but the phone was actually functioning about 2x to 3x faster than before!! Not to mention it got rid of a lot of crap apps I didn't even use! Thanks again so much, it really helped me out and saved me a lot of money!! hi mr blue...i cant access my tethering hotspot on my device(droid T912)...anytime i try to activate it. it goes blank..can u help....?? Sorry, I'm not familiar with that setup. And i am facing one more problem whenever i shut down my phone and tries to power it on it goes into AP fastboot mode again and then again untill i press the three keys and select the option normal power. Mr.blue waiting for your reply . Hi Shayan, unfortunately I'm not familiar with that issue. Perhaps try the Motorola forums. Hi William, did any of the steps in my original tutorial above throw an error? But can i flash the 4.1.2 (JellyBean): VRZ_XT907_9.8.1Q-94-1_CFC without unlocking the bootloader? You can flash the *same* stock OS as the one currently on your phone without unlocking the bootloader. If it doesn't work for you, I'm out of advice. Sorry. I am running android 4.4.2 kitkat sys. ver 183.46.10 on locked bootloader so which stock os should i use. But why cant i flash 4.1.2 (JellyBean): VRZ_XT907_9.8.1Q-94-1_CFC without unlocking the bootloader? By the way mr.blue u r the best ..... ! For some reason, my phone rebooted this morning and then became stuck in the reboot. Spent a couple of hours with Verizon -- no joy -- and a couple of hours on the phone with Morotola -- also no joy. Then I found your site. I downloaded everything and followed each of the steps. In each case, I received an exit line saying successful. However, in response to the fastboot continue command, phone went into reboot and, again, hung there. So I thought I'd try it again. (If at first . . . .) However, now my PC cannot see the phone. AP Fastboot screen says "connect usb" vs. "use connected." Response to fastboot devices is null. When I plug phone into laptop, Windows says "unknown device." Could that have something to do with the "erase modemst1" and "erase modemst2" commands? Hi Robert, which version are you trying? Some people start with the first bullet option in #10 and if that doesn't work, they try the second bullet option and finally the third as a last resort. Also, make sure the battery is mostly charged. Mr.Blue Coat said... help me in flashing my motorola verizon droid razr . just help me with all those steps that are needed to follow when updating it. looking forward to your reply. I did this with 4.4.2 . Everything flashed perfectly but when the phone boots up a few things go wrong. Mobile data doesnt even show up unless wifi is on. And compass won't work either. Im not sure whats wrong wether its the system files or what. Can someone help me with this problem. And when I pull down the notification bar and tap the icon for the quick settings, nothing happens. I had to use cmd prompt to flash everything because the flash program rsd lite never found my phone. I get all the way to the step where I type fastboot devices, and nothing happens - it says permission denied in Mac terminal. I'm trying to do this now. My XT107 (RAZR M) has been stuck at the eye. In AP fast boot it shows the device is Locked. status Code 0. It had OTA 4.4.2 prior to the problems. I ran fastboot oem fb_mode_clear, and got an "OK", but it's still locked. Fastboot continue rebooted, but no change in the phone. Phone is still locked in AP Fastboot. Suggestions? Hi Snaab78, "Data size exceeds download buffer" sounds like you're not using the Motorola version of fastboot. Hi Hank, try running "chmod 777 fastboot"